Mi-T-Fresh is the leader in case fresheners. Freshen anything and everything. Mi-T-Fresh is what "Fresh" smells like! 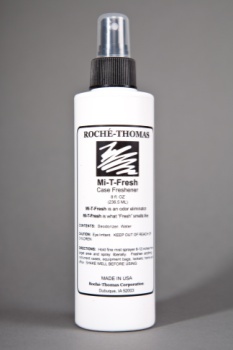 If your sports or instrument case smells musty, freshen it will Mi-T-Fresh. This formula was mastered by our Roche-Thomas craftsmen. Cases get spit, slobber and a musty basement smell, gross we know, that is why we originated a formula to bring your case back to life. Mi-T-Fresh turns any unbearable smell to pleasant and FRESH; and that my friend is Mi-T (mighty). This product comes in a 8oz cylinder container with a fine mist sprayer. At Roche-Thomas we are proud that we can say our products are manufactured in the USA using products made in the USA, so you know you are purchasing the finest products on the market.